Mercedes' new names for its SUVs and crossovers follows the GLA, shown. Mercedes-Benz is overhauling the names and nomenclature used to identify its vehicles as it prepares for the launch of 30 models, including 11 all-new vehicles, by 2020. Along with the new models planned, Mercedes said the changes are being made as the company prepares to introduce new body variants and drive systems. "This results in an increasingly complex situation when it comes to naming the models,” the company said in a statement today. Mercedes joins Nissan's Infiniti and General Motors' Cadillac among luxury brands that have significantly revised or plan to change the way they identify models. Some dealers have said the proliferation of models has posed marketing challenges and confusion among consumers, especially when companies have adopted alphanumeric names. The new nameplates will begin to appear next year when Mercedes will launch either redesigned or freshened version of all of its crossovers and SUVs. “After more than 20 years of continuity involving some of the most recognized and successful product names in the world, we are now making our system of vehicle nomenclature even more understandable,” the company said. The new nomenclature is a “simpler, more transparent and more logical system for the designations of our model series, with the aim of providing clear orientation for our customers," Jens Thiemer, head of Mercedes brand marketing communication, said in the statement. Mercedes will have five core models -- A, B, C, E and S.
All crossovers will have a GL in their name “in a tribute to the legendary G class,” the company said. The letter that follows will indicate the vehicle’s size, similar to the way the company has differentiated its sedans through the years. The G will remain the same. The company's four-door passenger cars with coupe-like styling will all have CL as the first two letters in their names. The third letter will refer to the size related to the core models. The cars include the compact CLA and the larger CLS sedans. Wagon or Shooting Brake versions of the cars are sold in Europe and other global markets but not in the United States. 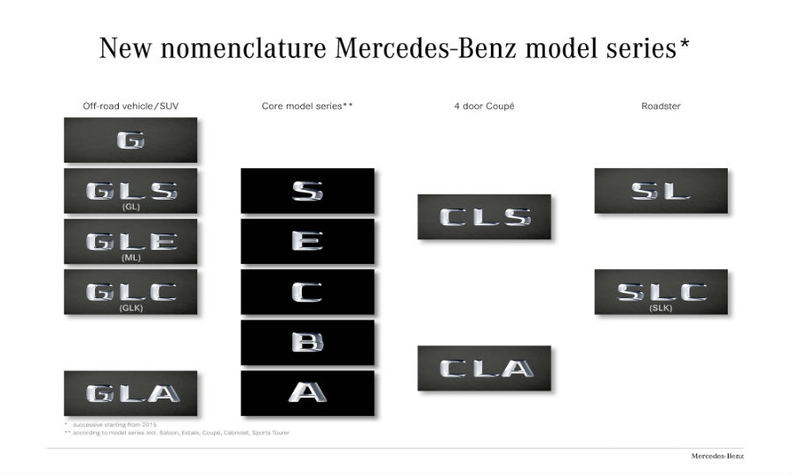 Beginning in 2016, Mercedes said the SL designation will be used on two-door roadsters and the third letter will also indicate the size. The SLK will be remained SLC. The SL name won’t change, “in recognition of its iconic status,” the company said. h for hybrid, currently Hybrid and BlueTEC Hybrid. Mercedes will continue to call its all-wheel drive models 4Matic. In addition, two sub-brands are being added.